ARRI 16SR cameras being upgraded at P+S Technik in Munich, Germany. The black front casting is from my 16SR2. NEW POLICY: The minimum service charge of 1.5 hours labor for film camera service (the first time any individual camera is brought to CinemaTechnic for service) must be paid prior to inspection of the camera. The minimum charge is $225.- and includes a written check-sheet of the camera’s condition. The minimum service charge is reduced to 1.0 hours minimum any subsequent time the same camera is brought for follow up service. Now that the resurgence in film origination has finally arrived, it sa become very difficult for film camera owners to find service and support for their equipment. Nearly all the qualified film camera technicians have retired. Those that are still working have moved on to other fields within the industry and have sold or discarded their tools and reference manuals needed to service film cameras. 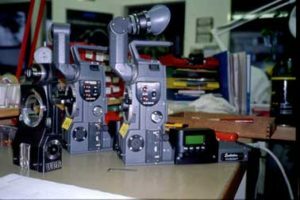 Although the focus of my business has been cine optics for the last several years, I have kept all my camrea service tools and technical documentation and I am still offering film camera service on a time-permitting basis. It is important to keep in mind that although it is possible now to purchase these limited-production high-precision film cameras for a small fraction of their original price, it is still just as labor and special-tool intensive to properly service the cameras. The problem is not unlike the situation with older old German high performance cars. Sure you can buy a 2000 BMW M5 for about 15% of its original selling price. But it is just as labor-intensive to service that car, it requires special knowledge on the part of the mechanic, and spare parts for it are still spare parts for a $70k+ car, no matter how cheap you bought yours. The situation is even worse with film cameras because spare parts are no longer available from the manufacturer for many of the older cameras. 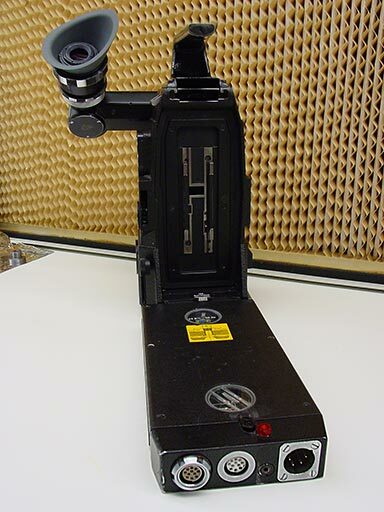 There is no longer any spare parts availablity from ARRI for any camera that was originally painted black (made prior to 1992). I only service ARRI and Moviecam cameras. 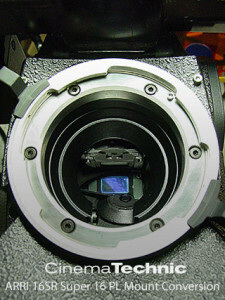 I specialize in the 16SR 1, 2, 3 and 35IIC and 35-3 models, and the Moviecam Compact and Moviecam SL. I still have all the required special tools to service and calibrate your Arriflex or Moviecam to factory standards. I can also service, with some limitations, Mitchell based 35mm, VistaVision and 65mm cameras. I am located in Burbank, CA, one of the few cities in the United States with a working film lab Fotokem. Please e-mail to schedule repair work (e-mail is preferred, please make the first contact through e-mail and I’ll will resond with a phone number). Average turn around time for most repairs is 5 business days if no replacement parts need to be ordered. If parts are needed, all bets are off. In addition, I will charge for time spent searching for spare part, although at a reduced rate. I will provide you with a list of what’s needed and you are welcome to source the needed parts on your own. My labor rate is $150.- per hour, 1.5 hour minimum, for scheduled jobs, minimum 5 business days time in shop. There’s a chance it might take less time, but if there are jobs ahead of yours, “in the pipeline”, I regret that your job must wait it’s turn. Time in shop is not guaranteed for normal labor rates. Film test time is charged at this rate. A discounted labor rate of $125.- per hour is charged for non-expedited jobs requiring a minimum 10 or more hours of labor, such as film camera overhauls (must be a single invoice and single item of equipment being repaired). This is the only discount I offer for film camera repairs. I still have a small stock spare parts in for ARRI 16SR, ARRI 35II-C and ARRI 35-III cameras. If I don’t have the parts you need a research rate of $75.- per hour is charged for needed research time (hunting for unavailable spare parts, etc.). Again, you are welcome (encouraged, actually) to do your own searching. Expedited “emergency” repair labor rate is $225.-/ hour. Expedited repairs must be scheduled, I may not be able to accept them if the shop is too busy. Generally, expedited repairs begin work as soon as the camera is received and are completed by the next day, and even the same day in some cases. Written confirmation of expedited delivery time will be given after work has begun and the equipment has been examined and diagnosed. The discount over 8 hours in not available for expedited work. If the equipment is not delivered on time, the expedited labor rate is waived, and the repair is charged at the normal labor rate. In any case you will be charged for express shipping of parts needed for your expedited repair. If a film test is desired, you are responsible for providing the raw stock and for all laboratory charges. If you are located in the Los Angeles area I encourage you to handle shooting the test yourself (I will provide guidance) and getting your film to the lab. If you need me to handle getting your film to the lab and interfacing with them, my time wil be charged at the research rate of $80.- per hour. Please note that I am not responsible for delays in processing test films or transfering to digital, and such delays are not considered in the delivery time for expedited repairs. I back up all our repairs with a six month service adjustment policy (repair labor only). Payment for all repairs is C.O.D. and expected at the time the equipment is delivered. If spare part that I do not have in stock are needed, you must pay for these part in advance of them being incoporated into your repair. If you are interested in this service it can still be done. I have enough parts for potentially two S16 conversions for ARRI 16SR. Pricing and delivery times will be on a custom-order basis and no guarantees of turn-around time are possible.